Introducing the revolution in bike training with the Cycleops 420 Pro Indoor Cycle. There are many Bikes in the marketplace but none provide the smooth feel of the Cycleops 420 Pro Indoor Cycle. Rated highly by many users and Fitness experts gives this Bike the number one spot on our list for home and institutional use. 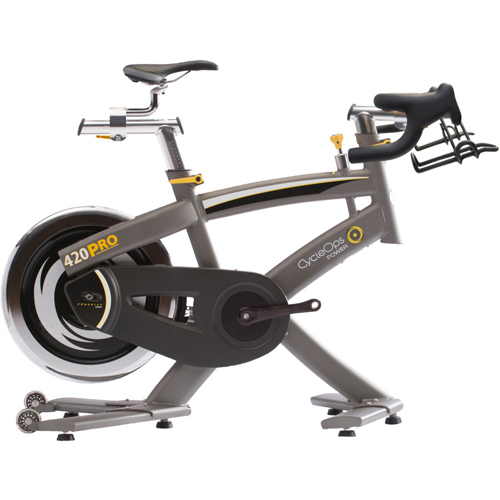 With its high quality and smooth feeling, its no wonder why many customers are buying the Cycleops 420 Pro Indoor Cycle over other top name Brands. Four points of adjustment to duplicate the fit of your outdoor bike. Freewheeling hub lets you stop pedaling and coast whenever your pace dictates to recover between efforts. Precise resistance control lets you dial up the difficulty level for whatever intensity you can dish out. Stable platform for sprinting workouts or hill climbs. Dual capacity water bottle holder to keep you hydrated for the long haul. Saddle and pedals can be swapped out for a more customized ride. With this machine the features and benefits mold into one. For example, riders can freely choose to duplicate the demands of either a race or a ride as they see fit according to their own specific goals. In fact, the amount of control riders have is off the charts. They can manipulate power, slope or gearing (just like a real bike) all while depending on dedicated resistance control as well. Insanity! Customization and adjustment is key which is why the CycleOps 420 Pro Indoor Cycle comes with four specific points that makes your indoor bike feel nearly exactly like a road bike. The platform is infinitely stable so it doesn’t matter how hard you’re pumping and with a 48-pound flywheel you keep steady and strong through every rotation. Even the standard features of the CycleOps 420 Pro Indoor Cycle are fascinating. Building upon the preceding model, updated freewheel motion makes it simple for riders to stay in control without going overboard either metabolically or calorically. It’s all about truly effective and efficient construction combined with the PowerTap technology that is accurate up to +/-1.5%! Therefore you can always depend and rely on the feedback that comes streaming in once you set off. Now, this cycle is ideal for both residential and commercial use. It has a small footprint and it’s a silent as a mouse so you can incorporate it into cycling classes at the fitness club or just stick it in the living room. Also, you can mix and match different gear combinations to find an investment price that works for your budget. Finally, when you pair the i420 with the iPad tablet you can control workouts and virtual training programs in a way that’s extremely hard to find anymore. It’s almost insane to think about, but, the frame comes with a lifetime warranty! Incredible, isn’t it? The frame is the most majestic part of this indoor cycle, but that’s not all folks. Parts, which excludes the normal wear and tear items comes with 3 years of coverage as well. After that all that’s left is the 21st century on-board electronics system which also comes with a 1 year warranty. So, basically, you’re covered from all angles so you can get to what’s important: physical conditioning and the love of cycling! NOTE: Pedals are available separately.